A dramatic increase in sightings of common dolphins across the Hebrides could be the result of climate change, an expert has said. Research conducted by marine conservation charity the Hebridean Whale and Dolphin Trust (HWDT) shows sightings of the mammals have reached a new record high. Evidence collected during research expeditions on the Trust’s specialised research yacht Silurian in 2017 has revealed an increase of 24% from the previous year’s already record-breaking figures. The findings were made in a research season running from April to October 2017, part of the charity’s unique long-term citizen science project monitoring whales, dolphins and porpoises, collectively known as cetaceans. The Trust also monitors basking sharks. 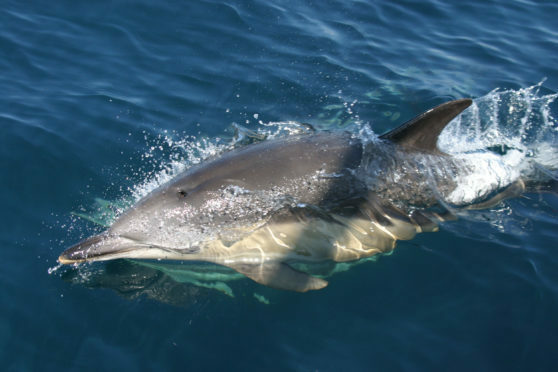 Dr Lauren Hartny-Mills, science and policy officer at HWDT, said: “We have never documented so many sightings of common dolphins off Scotland’s west coast before. Our findings highlight the importance of on-going monitoring and research to strengthen our understanding of what is taking place in Hebridean waters. The Trust recorded 93 sightings of common dolphins in 2017, its highest total ever, up from 75 sightings in 2016. The encounters included a total of 1,340 individual animals. This was down from 2016’s high of 2,303, due to smaller group sizes and fewer super pods. Over the past two years, the charity has also recorded a higher than average number of sightings of white-beaked dolphins. There were 14 sightings of 74 individuals in 2017. Generally preferring colder, deeper waters in the North Atlantic, white-beaked dolphins have distinct white noses. These fast, acrobatic swimmers are usually spotted further away from the coast – favouring sites around the Outer Hebrides, and usually seen in groups of five to 20 individuals. Dr Hartny-Mills said: “Silurian is more frequently travelling further north in her surveys, with trips now departing from Ullapool. This could explain why more white-beaked dolphins are being spotted each year. The latest survey season recorded nearly 3,000 whales, dolphins, seals and sharks during more than 1,100 sightings. Minke whales featured largely, with 62 sightings of 80 individuals. There were eight Risso’s dolphins sightings of 58 individuals. These figures are similar to numbers recorded in previous years. The harbour porpoise was the most commonly seen species with 363 sightings of 621 individuals. The annual expeditions depend on paying volunteers. Last year 75 volunteers worked alongside marine scientists, conducting visual surveys and acoustic monitoring.